The Montezuma County Board of Commissioners and Planning and Zoning Board met Thursday to discuss putting a 1 percent sales tax on the November ballot. Montezuma County commissioners are considering asking voters for a 1 percent sales tax in November to offset budget shortfalls from the local oil and gas market and dropping residential tax revenues. The proposal, announced Thursday, replaces an earlier idea to tax internet sales only. 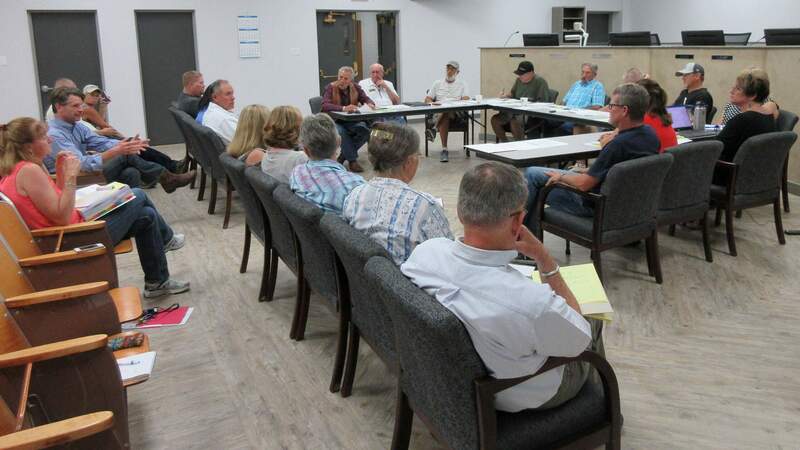 “We were informed by the state that targeting just internet sales is unconstitutional,” said commissioner Larry Don Suckla during a town hall meeting at the Montezuma County Fair. The broader proposal for a 1 percent tax would be added onto all sales in the county, including in Cortez, Mancos and Dolores. The tax would be applied to all internet sales as well. Estimates are that it would generate between $1 million and $2 million per year. Certain items would be exempt, such as groceries and agricultural equipment and goods. Montezuma County is one of a handful of counties in Colorado that does not have a sales tax. During a joint meeting with the Planning and Zoning Board on Thursday, county officials said the additional tax revenue was needed to retain the current level of services, including for road upkeep, planning, law enforcement, health, social services and recreation. This year, the county faced a $1.3 million budget deficit, said commissioner Keenan Ertel. Through spending cuts and wage freezes, commissioners reduced the shortfall to $475,000 and tapped into reserves to balance the budget. Property taxes paid by Kinder Morgan on carbon dioxide extraction from the western side of the county contribute 60 percent of the county tax base. Officials said it has been a boon for the county but makes it vulnerable. “We need something to replace that, because it is a finite resource,” said planning commissioner Bob Clayton. Planning and county officials said a sales tax would be more equitable than increasing mill levy taxes on property. Sales taxes are paid by everyone, county officials said, including visitors who buy goods at Mesa Verde National Park. A complex property tax system in the state also negatively impacts rural county budgets, county officials said. Under the Gallagher Amendment, 45 percent of the total amount of state property tax collected must come from residential property, and 55 percent of the property tax collected must come from commercial property. The Gallagher Amendment mandates that the assessment rate for commercial property, which is responsible for 55 percent of the total state property tax burden, be fixed at 29 percent. The residential rate, on the other hand, is annually adjusted to hold the 45/55 split constant. Because of skyrocketing home values on the Front Range, the residential tax rate was dropped statewide to stay within Gallagher’s ratio requirements. In Montezuma County, the residential tax rate recently dropped from 7.9 percent to 7.2 percent and is expected to drop further. “A sales tax would help backfill those losses, so we can maintain current level of services,” Ertel said. Commissioners will work on ballot language in the coming weeks, and plan forums to explain the sales tax proposal. For the measure to succeed, reaching out to Cortez, Dolores and Mancos residents is critical, said resident Chris Eastin. “That is where the majority of the voters live,” he said.